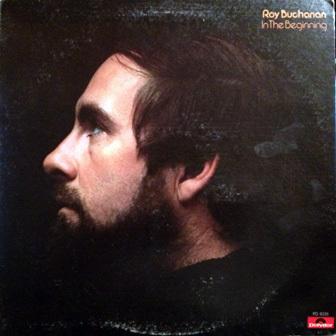 Ironically, «In the Beginning» (1974) was the final studio LP Roy Buchanan (guitar) cut during his four year (1970-1974) tenure on Polydor. While definitely mellower than his previous platter, That's What I Am Here For (1974), his fluid fretwork continues to capture and conjure a seemingly infinite number of moods and textures. Remaining at the center is Buchanan's respect of authentic R&B. His hearty solos are the unquestionable highlights on an effort that would perhaps otherwise be considered simply mediocre. The backing combo includes a core trio of Neil Larsen (keyboards), Kenny Tibbetts (bass), and Bill Stewart (drums), as well as a healthy sampling of the Tower of Power horns. Even with the intensity Buchanan brings to the cover of "Rescue Me" -- which had been a hit for Fontella Bass in 1965 -- there is a not only a discernible disconnect between the guitarist and his instrumental support, but also with vocalist Billy Sheffield. Purportedly, in a move instigated by the record company to sell more "product," Buchanan was to incorporate a lead singer. Ed Freeman (producer) incongruously attempted to incorporate Sheffield's unaffected shouting style to decidedly mixed results. More satisfying is the slinky Memphis soul of Al Green's "I'm a Ram" and the laid-back "C.C. Ryder," which commences with a lolloping lick reminiscent of Bob Dylan's "It Takes a Lot to Laugh, It Takes a Train to Cry." "Country Preacher" is recommended as it takes Cannonball Adderley's signature tune to a new strata during Buchanan's solos that make the strings alternately cry and sing with unfettered passion. Another zenith is the Nick Gravenites and Michael Bloomfield composition, "You're Killing My Love," which retains a great deal of the Muscle Shoals vibe on the Otis Rush original. Buchanan spins pure honey on the dark adaptation of "Wayfaring Stranger" titled "Wayfairing Pilgrim." His uncanny ability to conjure almost inconceivably disparate emotions within just a few bars of each other is one definite reason that he is in a league unto himself. Potential enthusiasts should note that this material would be issued in Europe as Rescue Me (1975). — Lindsay Planer.